So it has been almost a week now since the Philadelphia Flyers were “Knock, Knock”-ed out of the playoffs at the hands of the New Jersey Devils, and I figure its time to dissect the season that was in Philadelphia. Most fans on Facebook and Twitter seemed to think of this season as a “failure” and I disagree with that statement. I, myself, picked the Flyers to finish 6th or 7th in the Eastern Conference, and develop as a team more than impress. Was I disappointed by the ending? Yes, of course. But I also think that the positives that came from this season far outweigh the negatives. So let me clarify why, exactly, this season served as a stepping stone to the next 4 plus years of exciting and successful hockey for Flyers Nation. I would be remiss if I didn’t start my analysis with the fact that the General Manager Paul Holmgren cleaned house this summer. Fans were up in arms when Holmgren shipped out arguably the team’s two best players in Mike Richards and Jeff Carter. The Flyers accrued some good, young talent in Brayden Schenn and Jakub Voracek, who were both top-10 picks in their respective drafts in 2009 and 2007. They also picked up rough-and-tumble winger Wayne Simmonds and the 8th overall pick in last summer’s draft. Not to mention they inked goaltender Ilya Bryzgalov to a 9 year contract that same day. All in all, it was a 2 for 5 player trade. Not bad right? July 1st came and many expected the Flyers to add a few big-bodied pieces to round out the roster. But Holmgren had a few more tricks up his sleeve when he signed two former Pittsburgh Penguins in Jaromir Jagr and Maxime Talbot. Jagr proved to be a positive influence on the team, and especially on Claude Giroux. Contrary to the notion that he would be a distraction and prima dona, Jagr’s hard work inspired his teammates and he may be back next season. As for Talbot, he was brought in to be a “glue” guy in the locker room and add a veteran presence. Who would have thought that Talbot would chip in for 19 goals and 31 points (both career highs)? Talbot also found chemistry with Giroux on the penalty killing unit and added 2 shorthanded goals. The major question I had coming into the season was with this many new faces in the locker room, how would the team gel together? The feeling after being swept by Boston in the second round was that the team needed a goaltender and a “few tweaks” as Chairman Ed Snider put it. Instead, we saw out with the old and in with new. And it worked out. We got to see the personalities of the guys in the locker room right away. HBO’s 24/7 got us right into the locker room and we saw first hand, the youth and comradery that this team possessed. Leading up to and including the Winter Classic, we saw Claude Giroux’s chirping skills on ice, Bryzgalov’s “humongous big” personality, and Max Talbot’s sweater collection. To me, this has been the most approachable and fun Flyers teams that I have seen in all my years of watching hockey. And the best part about it; Most of these guys are under 26, meaning that if everything goes according to plan, they’ll be here for a long time. The feeling amongst Flyers fans was that it was a no brainer who the captain would be after the departure of Mike Richards. The “C” was going to the man who defined what a captain ,is and what a warrior is. Chris Pronger had only been in Philadelphia for 2 years and was coming off another off-season surgery, but he was poised and ready to captain this team. In late October, Pronger suffered a concussion and ultimately decided to sit out the remainder of the season. The team not only lost one of the best defensemen in the league, but a key member of it’s leadership on and off the ice. For a young team, this should have spelled disaster. Pronger wasn’t the only Flyer hampered by injuries this season. Claude Giroux and Danny Briere missed time with concussions. James van Riemsdyk suffered a concussion and later broke his foot. Brayden Schenn had a rough start to his season with a shoulder injury, a concussion, and a broken foot. Andrej Mezaros was sidelined with a back injury. The list goes on and on. But the veteran presence of Kimmo Timonen, Danny Briere, Scott Hartnell and Jaromir Jagr kept this team on track. Let this stat soak in: The Flyers had ONE losing streak of more than 2 games during the regular season (the 3rd loss was a shootout loss to the Islanders, so they still got a point). That is overcoming adversity. In case you haven’t heard, the Flyers rookies were kind of a big deal this season. As a whole, 7 rookies contributed 120 points this season, and 20 points in a total of 40 playoff games. That is pretty good production from first year players being thrown into the heat of the postseason. Erik Gustavsson played well filling when the back line suffered injuries. Zac Rinaldo was very useful as an agitator out on the ice, but needs to be more disciplined. That will come with age and experience. Eric Wellwood solidified himself a playoff spot on the roster for his play while James van Riemsdyk was on the shelf. Wellwood displayed his speed and should be on the checking line for next year. The three major bright spots among rookies were Sean Couturier, Brayden Schenn, and Matt Read. Individually, the Flyers top pick in last summer’s draft Sean Couturier displayed his defensive prowess in the playoffs against one of the leagues best players in Evgeni Malkin. Couturier was responsible for shutting down Malkin, and he did it with flying colors. He also showed that he is only scratching the surface of his offensive potential by scoring a hat trick in Game 2 against the Penguins. I believe we have gotten only a small taste of Couturier’s complete game. If Couturier can add more bulk to his frame, get more ice time with more skilled players, and earn more power play minutes, we could be looking at a Jordan Staal type of player. This kid has no ceiling. 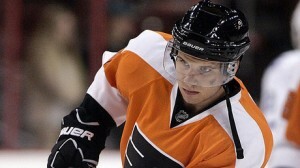 Brayden Schenn showed the glimpses of brilliance that earned him the comparison to Mike Richards. Like I said earlier, injuries attributed to Schenn’s slow start. But after scoring his first goal–in the Winter Classic, mind you–the kid never looked back. He posted 12 goals and 6 assists in just 54 games this season, and finally began to find chemistry with linemates Danny Briere and Wayne Simmonds. He took another step in the postseason with 3 goals and 6 assists. Schenn is defensively responsible and doesn’t shy away from contact. Like Couturier, more ice time will do wonders for Schenn and he will be an integral part of this team down the middle for years to come. Holmgren signed this undrafted free agent out of Bemidji State, and he saw great talent in him. And for good reason, as Read scored 24 goals this season to lead all rookies. Read is 25 years old and possesses more poise than maybe other rookies would coming into the league. Despite losing in the second round, the playoff run the young guys experienced is crucial to their development. What other team can boast this many rookies who step up and make the sort of impact they did? The future is bright for these kids if they continue to grow. It was only their first year of NHL playoff hockey, which is a completely different animal than any major junior league or Frozen Four appearance. They will be hungry for the atmosphere of the sea of orange at the Wells Fargo Center. They will be hungry to get under the skin of Sidney Crosby again. And most importantly, they will be hungry to bring the Stanley Cup back to the City of Brotherly Love. Paul Holmgren essentially handed the reins of this team to Claude Giroux when he traded Mike Richards and Jeff Carter. This was now to be Giroux’s team, and I think he answered the bell, and then some. He led the team with 93 points this season, good for third in the entire league, but the regular season isn’t where legends are born (Just ask Alex Ovechkin). Giroux’s leadership on and off the ice was on display throughout the entire series against the Penguins. Giroux was the guy that came out to the media after the 10-3 Game 4 loss to the Penguins and apologized to the fans. It was Giroux who led the team in scoring with 14 points in 6 games, and most notably, Giroux was the guy who demanded the first shift in Game 6 and proceeded to lay out Sidney Crosby and score a goal seconds later. His playoff performance was one for the ages. It was also one that had people coining Giroux the “best player in the world.” I think it is a little bit too soon for that title, but he is sure on his way to “superstardom”. Jaromir Jagr has compared him to Mario Lemieux. Colleagues and friends have compared his performance to Wayne Gretzky. Once again, I think it’s early but not out of the question. 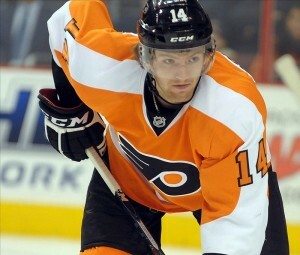 Questions are beginning to swirl about Giroux becoming the captain of the Flyers next season. Is he deserving of captaincy? Absolutely. Is now the best time to give it to him? I don’t think so. As for now Chris Pronger should, and will remain the captain of the team until he is deemed unable to play, as Holmgren said last week. But even if Pronger is unable to play, I think either Kimmo Timonen or Danny Briere should be captain to let Giroux focus on playing hockey instead of the media pressures of Philadelphia. 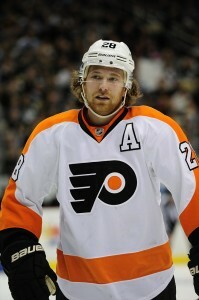 Eventually, Giroux will be named the captain of the Philadelphia Flyers. It was a frustrating season for Flyers fans. Finally, a Vezina nominated goaltender was brought in to end the woes between the pipes. Bryzgalov started the season with some big time performances and was living up to his contract. That was just the beginning of what was to become a very inconsistent year for the Russian net minder. To make matters worse, HBO’s 24/7 revealed Bryzgalov’s instability to the entire world. His confidence was shaken after not starting the Winter Classic. It was a rough start to the marriage between Bryzgalov and Flyers fans. There is a negative light cast of Bryzgalov by Flyers fans with the feeling that “this is only year one of nine more of this guy.” My response is exactly that: this is only year one of nine for this guy. Transition is tough for everybody. People getting transferred to a new job in a new state. High school graduates moving on to college. Albert Pujols moving from St. Louis to Los Angeles. People adjust differently to different situations. I am not defending his poor play or his off-ice distractions, but I am saying that patience is a virtue. He has shown flashes of brilliance in Phoenix and in Philadelphia. It isn’t like he forgot how to play goalie, he just did not transition well into a hockey crazed market like Philadelphia. Last season, Flyer fans showed Bryzgalov how they treat players who aren’t living up to expectations and who don’t seem to be taking the necessary steps to fix those shortcomings. By the same token, Bryzgalov also heard the “Ilya, Ilya” chants when he stood on his head in March. I believe that he will work out the kinks and come back a more focused goaltender next season. This was a learning experience for the Flyers as an organization. The organization learned that this team has all the makings of a Stanley Cup contending team. Max Talbot learned that if he shoots he can be a goal scorer. The rookies learned what it takes to get to the playoffs and that you can’t take any team lightly in the postseason. The organization and Flyers fans alike, learned that Claude Giroux is going to be a special sort of player and a face of the NHL. Ilya Bryzgalov learned how to play in Philadelphia, not to mention how “humongous big” the Universe is. We also learned that Mac Miller makes for a great post-game celebration music. So no, this season was not a failure at all. Next year is sure to provide the same excitement that this year did. Hopefully this summer will fly by for the Orange and the Black, the Orange and the Black.